Dubai, UAE, May 22, 2018: Mido is bringing the past into the present with the new Multifort Datometer. The brand is celebrating its 100th anniversary by revisiting one of its flagship models, first launched in 1939. The 2018 version borrows the original’s essential features while bringing it firmly up to date. Endowed with a superb polished and satin-finished steel case with rose PVD treatment, the Multifort Datometer reveals a silvered, finely sandblasted dial, decorated with black transfers, recreating the 1939 design almost identically. 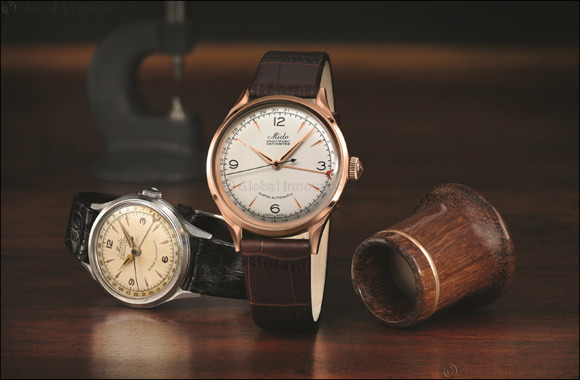 The characteristic detail of this rare and timeless model is the date, indicated by a hand with a red varnished tip. Beneath its vintage exterior, this timepiece houses an automatic movement with exclusive date indicator based on its Caliber 80, which offers up to 80 hours of power reserve. Produced as a limited edition of 1,918 pieces to echo the year in which Mido was founded, the Multifort Datometer will win over anyone looking to wear a piece of watchmaking history on their wrist. The collection is priced at AED 5000 and is available at Rivoli stores across the UAE only on preorder.